Ferry Piekart manages See All This online. He is also editor-in-chief of Dutch magazine 'Machina', is author of childrens books, likes to make experimental short films, and used to create augmented reality apps for museums. Ferry was both curator at the Netherlands Architecture Institute and format developer at television companies like Talpa. Het also wrote audiotours for Fries Museum, Kunsthal Rotterdam, Van Abbemuseum, museum Beelden aan Zee and the Oude Kerk in Amsterdam. Parade festival is all about theatre. Hence performances. So why would a museum join in? The Nederlands Fotomuseum figured that photographs are not restricted to an exhibition, but can also be presented as a show. So for the first time in the history of De Parade, there is a museum marquee among the theatre ones. 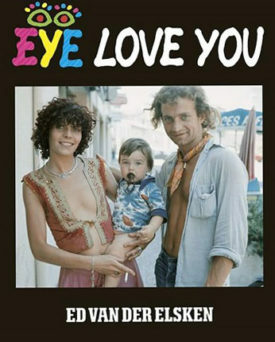 In it, you'll find the show 'Eye Love You - Ed van der Elsken'. Shows start every 20 minutes. Upon arrival you get wireless headphones on, and you're piloted into the marquee. At the centre of the marquee are several extremely comfortable couches for you to nicely sink into. In front of you are several big screens - higgledy-piggledy. A few minutes after, music suddenly sounds into your ears, and a narrator gives a brief introduction... while photographs of the Amsterdam-based photographer Ed van der Elsken are shown on the big screens. The photographer engages you in a journey and shows that love, life and death play the lead anywhere in the world. A beautiful show, in which the lens of Van der Elsken allows you to shamelessly watch people. The slides that you see, were recently restored - like the photographer's entire archive (45.000 slides!) is currently being restored; the biggest photo-restoration project in the Netherlands ever. When the show is over and you must get off that divine couch, it will look like you're heading straight for the exit, but surprise: there is one more space, in which the original slides that you just saw in the show are presented on tables (under glass). Magnifiers allow you to have another close look at every slide. Parade festival can be visited until August 28 in Amsterdam. in a range of different sizes, I ended up in the small movie theatre, where a documentary on Ulay suddenly roused my enthusiasm. I should have started with that film. 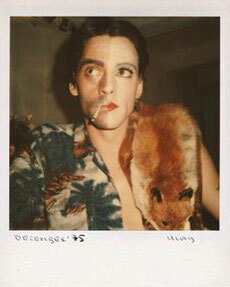 Because without the film, every polaroid in the exhibition is exactly what Ulay does not want: an afterimage. A residu of a time passed. Perhaps that's the core of photography - capturing a single moment - but it's also the exact thing that Ulay tries to defy. He made photography into a performance. It is hardly a coincidence that he chose a camera that became famous with the word 'instant'. Ulay really pushed the medium. He made a beautiful series of large format polaroids - but he didn't fixate them. Covered up, they were mounted onto a gallery wall; until he exposed the works before the eyes of numerous guests (with a glass of champagne in their hand). They saw beautiful images... that turned to black within ten seconds. People who were there were astonished. A photograph was never this 'live' and temporal before. With the stories from the film in the back of my head, I walked into the gallery once more. And I was impressed.